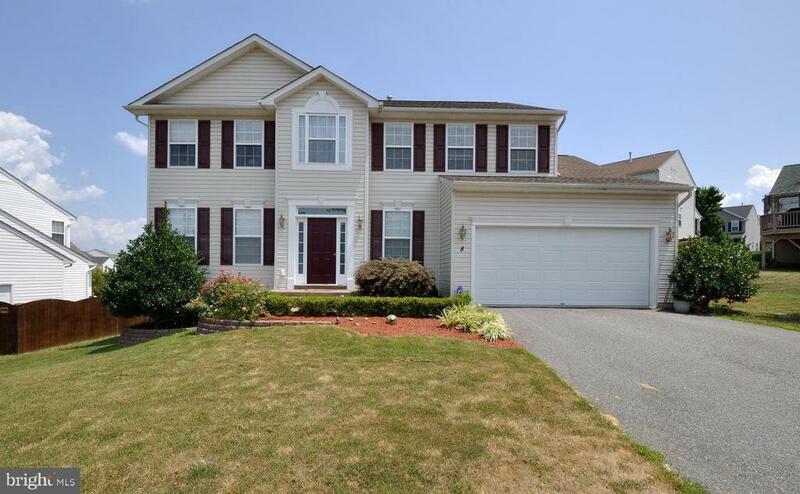 Beautiful colonial in sought-after Seasons Landing in Stafford. This bright two story foyer opens up to two rooms; a formal living room and a freshly painted kitchen that draws attention to the beautiful dark wood cabinets and island. The kitchen empties into a sizable family room. This warm and inviting space features a gas fireplace and numerous windows including two palladium windows. A sunroom provides additional space for table and chairs or a seating area overlooking the large fenced-in backyard and new deck. The dining area just off the kitchen provides a space for formal entertaining and large gatherings. A laundry room on the main level provides convenience and ease. The upper level has four nicely sized bedrooms including a spacious master suite with luxury private bath with a separate shower and walk-in closet. Close to schools, shopping, restaurants, I-95, commuter lots, and the VRE. Minutes to History Downtown Fredericksburg and the Rappahannock River. This property is a must SEE! Directions: From I-95 take exit 140 toward Route 1 on Courthouse Rd. Left onto US-1 N to Landmark Dr. Right onto Snow Drive. Right onto Fountain Drive. Property on the Left.